The new Kindle Voyage: An e-reader that makes you want switch to e-readers. Up until a couple years ago, I held on steadfastly to the whole idea of wanting to read with a real book in my hands, as opposed to seeing digitized pages on an e-reader. That is, until I got my hands on a Kindle, and became hooked. So I’m really happy to report that the newest Amazon e-reader, the Kindle Voyage, is just magical. 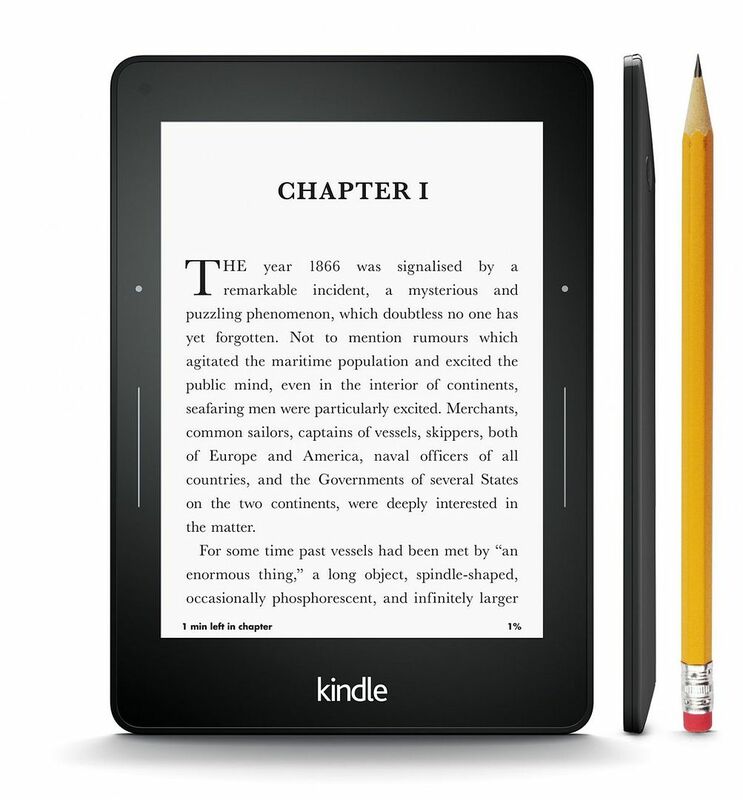 If you’re a Kindle devotee like me, the look and feel of the new device will be very familiar. But there are a lot of improvements that makes this what I think is the best e-reader yet. 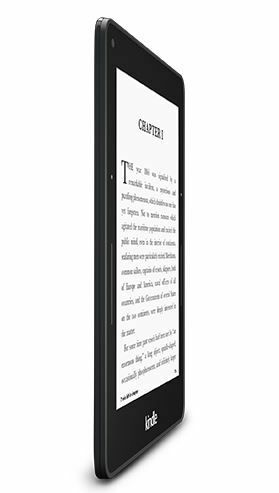 Size-wise, the Kindle Voyage comparable to previous versions with a 6-inch screen. The Voyage comes in just a hair smaller than the Paperwhite and it’s thinner and lighter too, making it even more portable. And I love that one battery charge lasts for weeks, so you don’t feel like you have to carry the cord with you everywhere. The biggest upgrade is the resolution of the Voyage at 300 ppi (that’s pixels per inch) which is a marked improvement over the Paperwhite’s 212. If you read a lot of books in bed at night, your eyes will definitely appreciate the difference. And speaking of reading at night, the Voyage also comes with a built-in adaptive light which adjusts to the ambient light it senses — dimmer for dark rooms, brighter for daylight or outdoors. In other words no glare. And no annoying anyone next to you in bed who might be sleeping instead of staying up all night rereading the Hunger Games trilogy. The other neat feature I really like are the touch sensors that Amazon has included on the sides of the tablet, so turning the page simply requires pressing gently on the side instead of needing to flick the screen. There were times I found it a little difficult to find the sensor in the dark though, so it would be great to see raised bezel sensors on the next version. But overall, an ereader is going to be about how easy it is to read, right? I really notice how crisp the text is, and it’s so realistic, I sometimes forget that I am actually using an e-reader. I guess that’s the whole point. As for storage, 4 GB is enough hold thousands of books including all those free Kindle books. Granted a lot of the free titles they offer up for download (as opposed to borrowing) seem to be romance novels and old Russian classics–Anna Karenina, anyone? Of course this all comes at a price. The WiFi version with special offers (in other words, ads appearing on the lock screen) starts at $199 and goes up from there. You have to figure out whether you’re willing to spend $80 more than the Paperwhite. In fact if if you already have a Paperwhite and are happy with it, it’s probably not worth the upgrade. But if you’re an avid reader and new to the e-reader market — or if you’ve got someone special on your holiday gift list who is — the Kindle Voyage offers a fantastic ride. 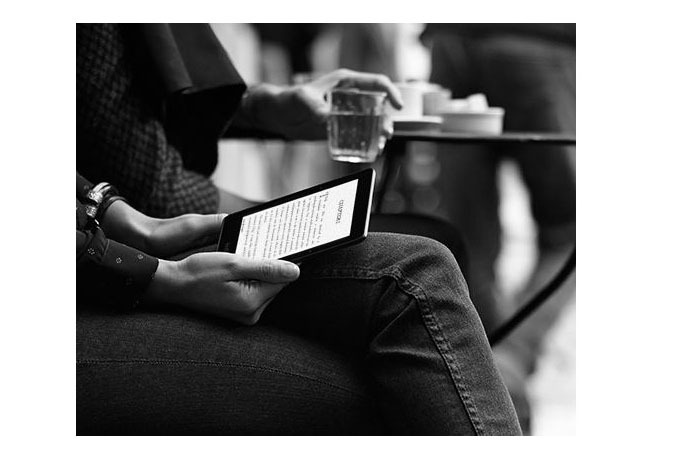 The Kindle Voyage will start shipping on December 4 from our affiliate Amazon. Thanks to them for providing us with a unit to review. Really? It will start shipping on Dec. 4? I have had my Kindle Voyage for about a month now. Lucky you! Unfortunately, Amazon keeps moving the ship date back for new orders. Now Amazon reports that the Voyage will be back in stock on December 9. Thank you for this post! I have (until two days ago) stuck to the “I like to turn REAL pages”, quote. I have been thoroughly researching the readers, and have decided that the Voyage would be a good place for me to start (I had a Nook when they first came out and HATED it). Your post helped show me that there are more women, other than just my best friend who has converted from the “no to e-readers” mindset to Kindle lovers. I can’t wait to get mine now! Your review/ post was amazingly helpful! Thank you so much!